1796: born in Edo in the family of the owner of a tea house located in the district of Shitaya. His name is Hirano Kichitarô. 1807: he is adopted by the dance master Fujima Kanjûrô I, who is none other than his uncle (the husband of his mother's sister). He receives the name of Fujima Kamesaburô. 1811: he becomes disciple of Nakamura Utaemon III, who gives him the name of Nakamura Tôtarô. 1812: Tôtarô and his master go together to Kamigata. 3rd lunar month of 1813: Nakamura Tôtarô takes the name of Nakamura Tsurusuke I in Ôsaka. 11th lunar month of 1825: Nakamura Tsurusuke I takes the name of Nakamura Shikan II in Kyôto. 9th lunar month of 1827: Shikan plays at the Kado no Shibai the roles of Honda Dainaiki, Sawai Matagorô, Narumi and Ishidome Busuke in the drama "Igagoe Norikake Gappa". 10th lunar month of 1827: Shikan performs his onagori kyôgen in Ôsaka at the Kado no Shibai, playing the roles of Kuzu-no-Ha and the yakko Yokanpei in the drama "Yomeiri Shinoda Zuma". He also performs all the roles of a 5-role hengemono called "Rangiku Tsuyu no Adamakura". 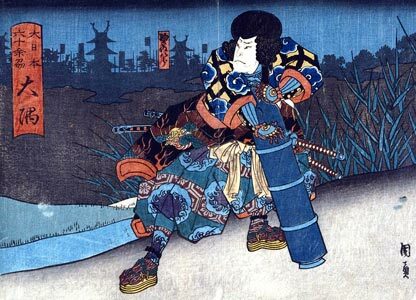 Winter 1827: Shikan goes to Edo. 1st lunar month of 1828: revival at the Nakamuraza of the dance-drama "Oshidori" by Segawa Jokô II; Shikan plays the roles of Kawazu Saburô Sukenari and the spirit of the male mandarin duck [more details]. 3rd lunar month of 1828: Shikan plays in the same theater the role of the warrior Kumagai Jirô Naozane in the drama "Ichi-no-Tani Futaba Gunki". He also performs all the roles of a 7-role hengemono called "Nijirigaki Nanatsu Iroha". Two of the roles, "Keisei" and "Tomo Yakko", are still part of the current Kabuki repertoire. 5th lunar month of 1828: Shikan plays in the same theater the roles of Ôboshi Yuranosuke, Kô no Moronô, Yazama Jûtarô, Ichimonjiya Saibê, the taiko mochi Ichihachi, Yasaku and Horibe Yajibê in the drama "Kanadehon Chûshingura". 9th lunar month of 1828: premiere at the Nakamuraza of the drama "Nochi no Tsuki Shuen no Shimadai" (commonly called "Kakuemon"). The main roles are played by Shikan and Segawa Kikunojô V.
10th lunar month of 1828: the Kabuki world is targeted by the authorities, which implements some sumptuary laws. Shikan and others actors are punished because of their ostentatious luxurious way of life. Shikan is placed for a little while under house arrest in a shop located in the district of Sakai-chô. 11th lunar month of 1828: Shikan becomes zagashira and plays at the Nakamuraza 8 roles, including Aku Genta, in Tsuruya Nanboku IV's drama "Motomishi Hana Otogi Heike"; his yearly salary is 700 ryô. 11th lunar month of 1829: premiere at the Nakamuraza of Tsuruya Nanboku IV's drama "Kin no Zai Sarushima Dairi"; Shikan plays the roles of Tawara no Tôta, Fujiwara Iyo-no-Jô Sumitomo, Bandô Tarô, Kazusanosuke, the shirabyôshi Hanako (in reality the ghost of Princess Kiyo) and the kyôgenshi Masuroku (in reality the ghost of Fujiwara Tadabumi) [more details]. 3rd lunar month of 1830: premiere at the Nakamuraza of the 9-role hengemono "Minokoshite Haru no Kokonoe"; Shikan plays all the roles, including the Yashima Court Lady, which is still part of the current Kabuki repertoire under the title "Kanjo". 3rd lunar month of 1831: premiere at the Nakamuraza of the five-role hengemono "Rokkasen Sugata no Irodori"; Shikan plays the five roles of Sôjô Henjô, Ariwara no Narihira, Bun'ya no Yasuhide, Kisen and Ôtomo no Kuronushi [more details]. 3rd lunar month of 1832: premiere at the Nakamuraza of the 3-part Kiyomoto/Tokiwazu/Nagauta-based dance "Yayoi no Hana Asakusa Matsuri", starring Bandô Mitsugorô IV and Nakamura Shikan II in the leading roles. This dance is still sometimes performed in its entirety but the second part, "Sanja Matsuri", is frequently staged independently. 7th lunar month of 1832: premiere at the Nakamuraza of the 4-role Kiyomoto/Nagauta hengemono "Odoke Niwaka Shabon no Tamatori"; Shikan plays all the roles, including a tamaya, which is still part of the current Kabuki repertoire under the title "Tamaya". 9th lunar month of 1833: Shikan performs his onagori kyôgen at the Nakamuraza, which is entitled "Tamukeyama Momiji no Mitegura". He also dances in duo with Ichikawa Komazô V in the Kiyomoto-based dance "Mata Kuru Haru Suzuna no Tanemaki". He also plays in the dôjôjimono "Ranbyôshi Oni-mo Furisode". Fall 1833: Shikan goes back to Ôsaka. 12th lunar month of 1833: Shikan plays at the Kado no Shibai the role of Kumagai Jirô Naozane in the drama "Ichi-no-Tani Futaba Gunki". 1st lunar month of 1835: premiere at the Kado no Shibai of the dance "Wake Futatsu Ninin Dôjôji", which stars Shikan and Nakamura Tomijûrô II. Winter 1835~1836: Nakamura Utaemon III decides to confer his name upon Shikan but many disciples of the star, led by Nakamura Tomijûrô II, are righteously indignant because they do believe that this name should be given to Nakamura Utaemon III's grandson (and adopted son) Nakamura Tsurusuke II. It follows that the dispute gets hotter and hotter and Nakamura Utaemon III has to invite all his followers to his home in order to definitively settle the matter. The star ends his explanation by a famous sentence: "I will not give my name to Fujima Kichi, but I will give it to Kichi's art" (Kichi is a diminutive of Kichitarô, the real first name of Shikan). As a consequence of the dispute, Shikan is also adopted by his master. 1st lunar month of 1836: Nakamura Utaemon III and Nakamura Shikan II respectively take the names of Nakamura Tamasuke I and Nakamura Utaemon IV at the Kado no Shibai. The two actors play together in the drama "Keisei Haru no Tori", which is produced by the zamoto Nakamura Umezô. Winter 1837~1838: Utaemon and the actors Arashi San'emon IX, Nakamura Tsuruzô I, Nakamura Kan'emon, Nakamura Tsurugorô, Nakamura Komasuke, Nakamura Kaei and Asao Okuyama go together to Edo. 3rd lunar month of 1838: Utaemon plays at the Nakamuraza in the drama "Sanmon Hitome Senbon". 11th lunar month of 1838: premiere at the Ichimuraza of Nakamura Jûsuke IV's Tokiwazu-based dance "Hanabutai Kasumi no Saruhiki", commonly called "Utsubo Zaru"; Utaemon plays the role of the monkey-showman [casting]. 3rd lunar month of 1839: premiere at the Nakamuraza of the 8-role hengemono "Hana Goyomi Iro no Showake", which is performed by Utaemon. One of the role, "Toshima", is still part of the current Kabuki repertoire. 1st lunar month of 1843: premiere at the Ichimuraza of the dance "Kashiragaki Ise Monogatari" (commonly called "Noriaibune"), which is staged within the new year drama "Kioi Uta Soga no Hanadashi"; Utaemon is one of the seven dancers [more details]. 1st lunar month of 1845: premiere at the Nakamuraza of Sakurada Jisuke III's dance-drama "Awa Mochi"; Utaemon plays the role of an awa mochi maker [more details]. 1st lunar month of 1846: premiere at the Nakamuraza of Sakurada Jisuke III's Tokiwazu-based dance-drama "Kagura Uta Kumoi no Kyokumari", which is commonly called "Dontsuku"; Utaemon plays the leading role [more details]. 4th lunar month of 1847: premiere at the Kawarasakiza of the dance-drama "Shiki no Hina Asakusa Hakkei" (commonly called "Kyô Ningyô"); Utaemon plays the role of the carver Hidari Jingorô [casting]. 12th lunar month of 1849: Utaemon and his adopted son Nakamura Fukusuke I settle in Ôsaka. 5th lunar month of 1850: Utaemon plays at the Naka no Shibai the role of Danshichi Kurobê in the drama "Natsu Matsuri Naniwa Kagami". His stage partners are Jitsukawa Enzaburô I (Tsuribune Sabu) and Mimasu Daigorô IV (Issun Tokubê). 1st lunar month of 1852: Utaemon appears on stage for the last time, at the Naka no Shibai, performing in the drama "Yotsu no Umi Taira no Yozakari" and the dance "Yosooi Rokkasen". He suddenly falls ill and dies the followng month. Nakamura Utaemon IV's best roles: Kumagai Jirô Naozane ("Ichi-no-Tani Futaba Gunki"), Matsuômaru ("Sugawara Denju Tenarai Kagami") and Ishikawa Goemon ("Sanmon Gosan no Kiri"). He was not at ease in sewamono but he excelled in jidaimono. Nakamura Utaemon IV was just like his adoptive father Nakamura Utaemon III a kaneru yakusha, able to perform a broad range of male or female roles. He was also an outstanding dancer. He was the first actor to use the yagô Narikomaya instead of the usual Kagaya. This new yagô was related to a present made by Ichikawa Danjûrô IV to Nakamura Utaemon I when he was on tour in Edo: the Edo star gave to the Kamigata actor a beautiful costum decorated with a Chinese chess piece pattern (koma in Japanese). The yagô of Ichikawa Danjûrô IV was Naritaya. Narikomaya was therefore created using the ideograms koma and nari, the first ideogram of Naritaya. This new yagô was a way for Nakamura Utaemon IV to express the fact that he felt more like an Edo actor than a Kamigata actor.